"Thank you Purple emu for allowing me to be part of the trial for your new pain relief cream: Purple Rub I have to tell you this cream is absolutely awesome! I have suffered with a herniated disc in my lower back and osteoarthritis in my neck and upper back for a number of years. For the first time I actually have something that gives me relief from the pain and the stiffness it causes! And for a bonus, one application lasts for HOURS, no reapplying every 30 minutes like other creams. Thank you; thank you a thousand times over for Purple Rub. I can finally sleep through the night!!" "While playing tennis, I started having pains in my hand and wrist to where I couldn't even hold the racquet any longer. I heard of Super Blue Stuff, but preferred an all-natural product. Purple Rub worked great! After only one week, the pain was gone and my tennis game is back!" 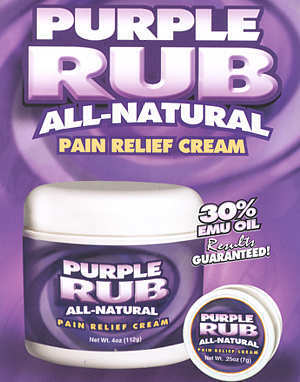 Purple Rub, when nothing but the best will do for your pain. Ingredients Active ingredients: Menthol (7.9%) and Camphor (3%). Purple Rub - .25 oz. Purple Rub - 4 oz.